By Magda Borzucka and Bogna Haponiuk. What is the debt to asset ratio? How to calculate the debt to asset ratio? Thanks to this debt to asset ratio calculator, you will be able to quickly evaluate the financial condition of your company and the risks associated with its current indebtedness. In this article, you will find an explanation of how to calculate the debt to asset ratio - or, in other words, the relation between the debt portion of your company's liabilities and its assets. 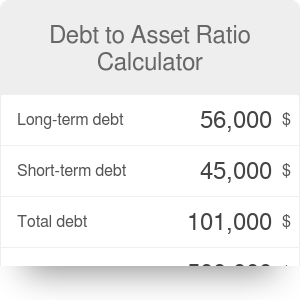 We will also explain all components of the debt to asset ratio formula. As mentioned earlier, the debt to asset ratio is a relation between total debt and total assets of an enterprise. It shows what proportion of the assets is funded by debt instead of equity. A high debt to asset ratio means a higher financial risk, but, in a case of a flourishing economy, a higher equity return. This metric is used mostly by investors and creditors. The first group uses it to evaluate two things: whether the company has enough funds to pay its debts, and whether it can pay the return on its investments. Creditors, on the other hand, assess the possibility of giving additional loans to the company. If the debt to asset ratio is exceptionally high, it indicates that repaying existing debts is already unlikely, and further loans are a high-risk investment. Total assets of the company. This metric is most often expressed as a percentage; however, you might come across a number such as 0.55 or 1.21. To obtain a result in percents, simply multiply such a value by 100%. As you can see, the values of the debt to asset ratio are entirely different. What do these results mean? The ratio for company A is rather low - it means that the majority of the company's assets is funded by equity. Having this information, we can suppose that this company is in rather good financial condition. Company B, though, is in a far riskier situation, as their liabilities in the form of debt exceed their assets. For a bank, it makes more sense to give a loan to company A. This example shows that the dependence between the debt to asset ratio and the company's financial health is simple: the higher the proportion, the riskier its situation. If the debt to asset ratio exceeds 100%, it means that a company has more liabilities than assets and may even go bankrupt soon. Still, there are upsides to a high debt to asset ratio. It indicates an extreme degree of leverage, what consequentially means better returns in the case of success (provided you can find someone willing to invest in a company with a high-risk profile). Of course, debt to asset ratio is not the only indicator of a company's debt management situation. To get a full picture for company B, you should also take a look at other metrics, such as their debt service coverage ratio. Magda Borzucka and Bogna Haponiuk. Debt to Asset Ratio Calculator can be embedded on your website to enrich the content you wrote and make it easier for your visitors to understand your message.